All breeders naturally select brood stock to suit their own particular needs. The majority of dogs in any Stud are naturally used for duties on their owner's property. Conditions vary greatly from one district to another, the dogs being selected for use on plain, undulating, or hilly country, etc. where owners run different breeds and types of sheep. For this reason it is suggested that you contact Breeders who are situated in districts similar to your own, and when doing so you should describe your conditions as fully as possible. This assists the Breeder to offer and select a pup most likely to suit your requirements. You should also enquire whether the Breeder guarantees his dogs and if so under what terms. The Directory was established by the accredited Breeders of the day who co-operate to advertise and provide many of this Council's services. The aim of the Breeders listed is to produce a continuity of dogs which possess a high degree of natural ability and which are easily trained and versatile. To enable them to do so they need the co-operation of the buyer generally to supply a report on the dogs' progress from time to time. Please remember that unless you report one way or another the breeder has no way of knowing what the overall result of his breeding program has been. This page from the current WKC News Bulletin lists the Dogs/Pups available to purchase. We would like to mention that some difficulty may be experienced in obtaining exactly what you require in this regard. The demand for broken in dogs is always high and very few are available. When the odd ones are offered they command a premium price. To rear and train a dog to this stage involves a very considerable amount of time and expense. Unfortunately few buyers are prepared to offer a price which would encourage a handler to take dogs through to this stage. At the present time young or started pups represent a far better return to the Breeder. We respectfully suggest that you consider the purchase of a 'ready to start', 'started', or 'well started' pup. In many ways they represent a better buy because they adapt to a change of ownership more completely and far more quickly than the older dog. Being started, their natural ability is known, and the potential can be assessed. Furthermore, most of the basic training has already been done. Buyers are advised to enquire whether the breeders of their choice guarantees his or her stock to work and, if so, seek written details before proceeding with the purchase. This advice is offered regardless of whether the breeder holds a WKC Breeders' Directory listing; is a member of the WKC; a member of another canine association or just a freelance breeder. Claims under verbal guarantees or undefined terms are difficult to handle in cases of dispute. Whilst the majority of Breeders listing stock for sale in the WKC News Bulletin guarantee their stock to work, it must be born in mind that Breeders have the right to refuse to guarantee their stock; however notice to this effect should be included within the text of any advertisement appearing in the ‘Breeders Notes’ pages. The terms of the guarantees when offered by WKC Breeders are either those drawn up by the breeder himself or those set out in the WKC guarantee drawn up for use by WKC members. When introducing Stud Registering facilities the Council was conscious of the need of a positive way of identifying individual dogs not only with their entry in the Stud Register but also in the event of disputed ownership or in cases of loss, theft and so on. The permanent tattooing of the ear or flank, whereby the dog carries his breeder's symbol and individual number and year code letter, has proved to be a most satisfactory solution. After the 31st July, 1970 tattooing became a part of the dog's eligibility for registration in the Main Section of the Stud Register and Stud Book. Appendix facilities continue to provide for dogs bred by Breeders who do not wish to co-operate and for dogs which fail to qualify because of shortness of traceable pedigree etc. Before taking delivery of your Kelpie please check the tattoo against the details supplied by the breeder. It is recommended that prospective buyers enquire about pedigree and registration. There are two Stud Registers. The National Stud Book register for dogs with four or more generations of proven recorded breeding and an Appendix register which caters for dogs of shorter recorded working background. The registration numbering system is different in each Register. Dogs registered to the National Stud book carry only numerals, Dogs registered to the Appendix start with the letter ‘A’ The dog's registration in the Stud Register is a worthwhile indication that it possesses a genuine working background or ancestry. Dogs bred by non-members carry ‘Ref:’ before a previously WKC registered prefix and are not deemed fully registered for competition in the WKC National Field Trial Championship, etc. ; nor are they eligible for issue with WKC Export Certificates. ‘S/Bred’ before the dog's name indicates that the breeder does not hold membership or a prefix recorded with the WKC. ‘Show’ indicates that the background is registered with one or other of the State canine bodies catering for the exhibition of dogs. A list of well-known working strain stud prefixes is obtainable and can be used as a guide to the working credential of the dogs appearing in a pedigree. We would like to point out that whilst the Breeders select for sheep working ability, most of the stronger forcing strains will successfully handle beef or dairy cattle. 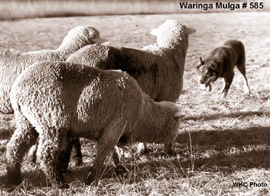 Many of the listed Breeders expect their dogs to be able to efficiently handle both sheep and cattle. However, before making your final selection you should ask the Breeder if his dogs have been tried for cattle work, either by himself or by a number of his clients. Carefully describe the type of cattle and conditions under which you run them. By giving the fullest details possible you will enable the Breeder to decide whether he can assist you or not. Some difficulty and/or delay may be experienced where an intending buyer stipulates a particular colour. 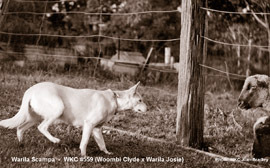 The Kelpie was evolved from a mixture of imported Working Collies introduced into Australia in the 1800's. Of those, which form the actual foundation strain, five were black and tan, and one was black. The latter, a dog called Moss, carried a blue grey colour factor and was the first to produce blue or slate coloured pups. Brutus and Jenny, themselves black and tan, were the first to produce red coloured pups; these appeared in a litter born shortly after the parents' arrival in Australia and were the result of a mating of the two dogs on the way out from England. The red colour is well known in the Working Collie family and was not the result of a Dingo mating here. Black is the dominant or strongest colour. The tan markings associated with all colours are believed to be controlled by another inherited factor. Blue is a mutation of the black or a lightening of black due to a dilution factor. Red is the Recessive Colour. The showing of Kelpies at Bench or Breed Shows has encouraged a section of breeders to concentrate on the production of either all red or all black pups. Selection over a number of years for colour alone, in preference to selection for sheer natural ability, appears to have caused a loss of working ability in some strains. To meet the overall requirements of the Pastoral Industry, the Working Kelpie Breeder has had to maintain a very high standard of natural working ability in his stock. To achieve this, ability has taken precedence over colour. Today, most of the best working strains carry a variety of recognised colour factors, including those responsible for tan markings. Because a range of colours is often produced in a litter, the Breeder may not be able to supply a pup of a specified colour at short notice.